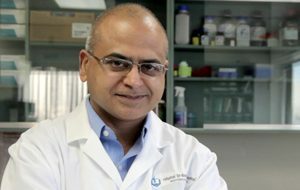 Dr. Sanjiv Dhingra, Principal Investigator, Cardiac Regeneration and Tissue Engineering Laboratory, Institute of Cardiovascular Sciences has co-edited the recently released book “Adult Stem Cells – Methods and Protocols” (Springer) with Dr. Paulo Di Nardo (University of Rome Tor Vergata) and Dinender K. Singla (University of Central Florida). The book contains a collection of protocols from some of the major laboratories involved in stem cell research across the world. The research discussed in this book covers topics such as: isolating, characterizing and expanding dental pulp stem cells; manipulating the proliferative potential of cardiomyocytes by gene transfer; isolation of stromal stem cells from adipose tissue; noninvasive assessment of cell fat and biology in transplanted mesenchymal stem cells; and cell-free therapy for organ repair. Written in the highly successful Methods in Molecular Biology series format, chapters include introductions to their respective topics, lists of the necessary materials and reagents, step-by-step, readily reproducible laboratory protocols, and tips on troubleshooting and avoiding known pitfalls. Adult Stem Cells – Methods and Protocols is a resource for helping researchers transform the study of stem cells into an industrialized process that will supply patients with efficient, safe, and cost-effective cell treatments.